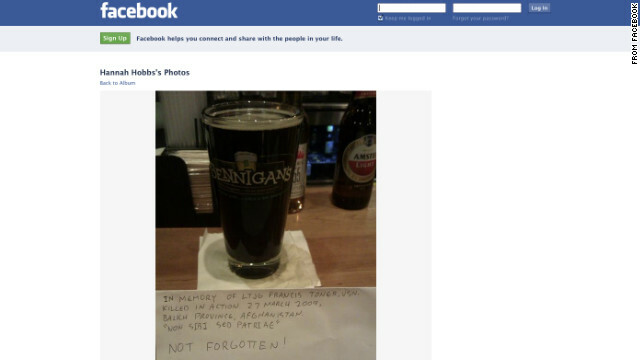 A bar patron's toast to a fallen sailor has become a phenomenon on Facebook. In memory of Lt. j.g. Francis Toner, USN. "This guy came in today and asked if it was ok if he left this on the bar.. I cried 😦 I left it there until like 1130 tonight.... I didn't want to pour it out but I had to. So I'm posting this pic so it can stay forever!! So can I get some likes people??" The CNN Daily Mash-up is a roundup of some of the most interesting, surprising, curious, poignant or significant items to appear on CNN.com in the past 24 hours. We top it with a collection of the day's most striking photographs from around the world. Today being Memorial Day, the CNN Daily Mash-up focuses on those who have served and are serving and defending America with honor. Memorial Day is the day America sets aside to honor the sacrifices of our armed forces. Many have given their lives; many have given limbs; some have sacrificed any hope of ever living a normal life again. When the peace treaty is signed, the war isn't over for the veterans or the family. It's just starting. I've never stopped thinking about him. My heart is filled with pride that you can't even imagine. A veteran is someone who, at one point in their life, wrote a blank check made payable to 'The United States of America' for an amount of 'up to and including my life.' Thank you to all our troops, veterans and their families for all the sacrifices they make every day for us. You have my admiration and appreciation. 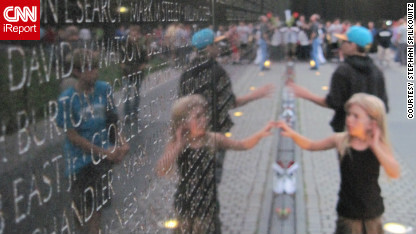 CNN iReporter Stephan Spilkowitz shot this photo of children at the Vietnam Veterans Memorial in Washington on May 15. “The memorial was crowded with tour groups and visitors, yet of all the monuments and historical sites we visited in D.C., the crowd possessed a level of dignity, silence, and respect unmatched by any other monument,” he said. Yep, men in uniform sure look good. They often sound good, too. Another CNN iReporter, Faith DeCeglia, shot a series of good photos of the Quantico Marine Corps Band performing in New York's Times Square for Fleet Week. "I hope the members of our armed forces enjoyed the events as much as the civilians," she said. "It looked to me as [though] they did." A deafening parade of motorcycles in our nation's capital is meant to honor military members who were captured by enemy forces, some never to be seen again. These riders make sure they're never forgotten. The Greatest Spectacle in Racing generates great quantities of trash, CNN affiliate WTHR reports. The quarter of a million people who jam the Indianapolis Motor Speedway for the Indy 500 on the last Sunday in May leave a whole lot of junk behind. So at 8 a.m. Monday, another tradition takes place, as nonprofit groups pull on gloves, pull out the trash bags and pull together to clean the place up. In exchange, the IMS donates money to their causes. President Barack Obama will award the Presidential Medal of Freedom to a sizable roster of recipients on Tuesday. The Medal of Freedom is our nation's highest civilian honor, presented to individuals who have made especially meritorious contributions to the security or national interests of the United States, to world peace or to cultural or other significant public or private endeavors, according to the White House. The recipients are: diplomat Madeleine Albright, civil rights lawyer John Doar, singer Bob Dylan, public health pioneer William Foege, astronaut/senator John Glenn, civil rights advocate Gordon Hirabayashi, workers' rights activist Dolores Huerta, Polish resistance hero Jan Karski, Girl Scouts founder Juliette Gordon Low, novelist Toni Morrison, Israeli public servant Shimon Peres, former Supreme Court Justice John Paul Stevens and retired University of Tennessee women's basketball coach Pat Summitt. Tuesday birthdays: Actor Anthony Geary, 65; V. Gene Robinson, first openly gay Episcopal bishop, 65; attempted assassin John Hinckley Jr., 57; singer-songwriter Melissa Etheridge, 51; basketball player Carmelo Anthony, 28. Overheard on CNN.com: Do I have to talk to grocery clerks? Editor's note: This post is part of the Overheard on CNN.com series, a regular feature that examines interesting comments and thought-provoking conversations posted by the community. Smart phones, Facebook, Twitter and text messages give people the ability to communicate with anyone, anywhere at anytime? But what about the person right in front of you. Psychologist and MIT professor Sherry Turkle says technology is giving users companionship without the demands of a relationship. Her essay has generated an interesting etiquette debate. Many said acknowledging someone who's helping you is just the right thing to do, while other CNN.com commenters thought making small talk was pointless. JustinAT88 says "I hate it when store clerks talk to me. 'Hi how are you today?' Like they care, they get paid $7.25 an hour. I'd much rather prefer someone who doesn't give two craps and just rings me out with the quickness. No small talk, no nothing. 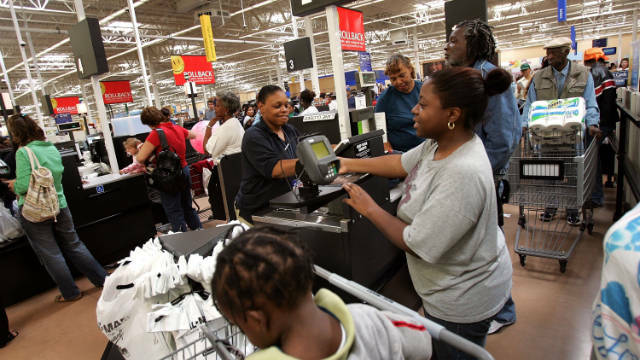 It annoys me, you are not happy and cheerful at $7.25 an hour working at a store, you're just not." Lexagon agreed, saying "so, in the example given, the person should forgo communicating with people with whom she has a personal relationship to trade empty pleasantries with the supermarket checkout guy?" woodartist said those pleasantries weren't always empty. "Perhaps you'd also appreciate a cashier who looks at what you're buying at someplace like Home Depot and then points out that you've got the wrong products and they won't work together. Just maybe that casual conversation that you abhor will save you a bunch of effort, time, and...oh yeah...some money too. I can't count the number of times I stopped someone who was clearly doing a "plumbing project" with pipe that can't be used for water. DOH! When I asked, and they responded, not one complained when I explained the potential problems and see that they ended up with the right stuff." Commenters like Jo said it was about manners, not technology. "It is quite rude to ignore anyone who is speaking to you. It's not asking too much to pass the time of day with a clerk. Their job is boring and mundane as it is, and chatting up a customer is just good business - it creates a personal relationship between you and the store. Good manners aren't changed by technology, except by people who haven't got the finesse to be courteous to begin with." "It's not sad. It's amazing. Now that we can be linked with all our friends at any time we want, accommodations must be made for the time spent communicating. Life hasn't gotten colder, only more communicative. What you call a neurosis is a scientific blessing, especially for those who have so many friends and associates that they can't see them all in a day." What do you think? Is it OK to text in line? Share your opinion in the comments area below and in the latest stories on CNN.com. Or click on the blue button below to file an iReport with your webcam. A fire swept through a shopping mall in Qatar's capital city, Doha, on Monday, killing 19 people, 13 of them children, a government official said. The fatalities at the Villagio shopping mall included seven girls, six boys, four teachers and two members of the civil defense, said the minister of state for interior affairs, H.E Sheikh Abdullah bin Nasser bin Khalifa Al Thani, in a posting on the ministry's Facebook page. Another 17 people were injured, four of them children, he said. Most of the other injured are civil defense firefighters, he said. The livid white-haired Syrian’s question to the U.N. blue helmet was rhetorical. He didn’t expect a real answer, not to that question. “Did the infant carry an RPG?” he asked angrily, gesturing wildly, his hands clad in red rubber gloves. He had washed the bodies of nine slain children already, one of whom was not even a year old, he told the U.N. observer. He wanted to know why. That question he actually wanted answered. The observer appeared overwhelmed. “Why are they treating us like animals?” the man demanded. It was an understatement. Across Houla, an anti-regime suburb of Homs, images emerged indicating people there had been treated like something less than animals. The bodies of 108 people killed, most of them women and children, filled rooms, rugs and the backs of trucks. Children were missing limbs. Others suffered gaping head and chest wounds. Images showed children sprawled on blood-smeared floors, their lifeless eyes staring into oblivion, their clothing torn and stained crimson. While many young victims were apparently shot, there were reports that children had been stabbed to death or attacked with axes. U.S. National Security Council spokesman Tommy Vietor said the United States was horrified by "credible reports" of the massacre, "including stabbing and ax attacks on women and children." A weakened Tropical Depression Beryl was soaking parts of Florida and Georgia on Monday, leaving thousands in the dark and hindering Memorial Day activities. A tropical storm warning for a large swath of the southeastern Atlantic Coast was canceled as Beryl weakened Monday. However, the National Hurricane Center said tropical storm-force wind gusts remained possible over coastal Florida and Georgia, particularly in rain bands associated with the storm. As of Monday morning, 3.47 inches of rain had fallen on Keystone Heights, Florida, about 25 miles northeast of Gainesville, according to the National Weather Service. Green Cove Springs, Florida, about 28 miles south of Jacksonville, had gotten 3.35 inches of rain. Because of Beryl, Jacksonville Mayor Alvin Brown canceled all Memorial Day ceremonies. A Memorial Day event at the Veterans Cemetery in nearby St. Augustine also was canceled, CNN affiliate WTLV reported. The Jacksonville Transportation Authority suspended all bus routes to area beaches. Twelve flights scheduled to leave Jacksonville were canceled Monday, according to the Jacksonville Aviation Authority. Beryl's powerful winds knocked out power across the region. Outages in the Jacksonville area were under 20,000 Monday morning, according to Tam Roman with the Jacksonville Emergency Preparedness office, down from about 37,000 overnight. International envoy Kofi Annan arrived in Syria on Monday amid growing fury over a gruesome massacre that killed 108 people in one town. He vowed "serious" discussions with President Bashar al-Assad and said he had a message for "everyone with a gun": to halt the violence. Rebel leaders have said Annan's six-point plan is already "dead" following the killings in Houla, a suburb of the anti-government bastion of Homs. U.N. monitors in Syria said 49 children were among those slaughtered there Friday. Al-Assad's regime insists it was not behind the massacre and blames terrorist groups. Throughout the uprising against the government, Syria has blamed violence on "armed terrorist groups." But throughout Syria, people pointed fingers at the government. One man who helped prepare the bodies of children - including a baby - for burial asked a U.N. observer, "Why are they treating us like animals?" Annan, the U.N.-Arab League special envoy, will meet with al-Assad and senior officials, as well as representatives of the opposition and civil society. He will review the work of the U.N. monitoring mission in the country as well. "I have come to Syria at a critical moment in this crisis," Annan said, according to his spokesman. "I am personally shocked and horrified by the tragic incident in Houla two days ago, which took so many innocent lives, children, women and men. This was an appalling crime, and the Security Council has rightly condemned it." The race to the presidency now turns toward the general election in November. CNN.com Live is your home for all the latest news and views from the campaign trail. 11:00 am ET - Tomb of the Unknowns wreath-laying ceremony - On this Memorial Day, President Obama will participate in a wreath-laying ceremony at the Tomb of the Unknowns at Arlington National Cemetery. The president will then speak at a Memorial Day ceremony at the cemetery around 11:20 am ET. Kofi Annan speaks to the press upon his arrival in Damascus for talks with top officials on May 28. U.N. monitors say 108 people, including 49 children, were massacred in one Syrian town. 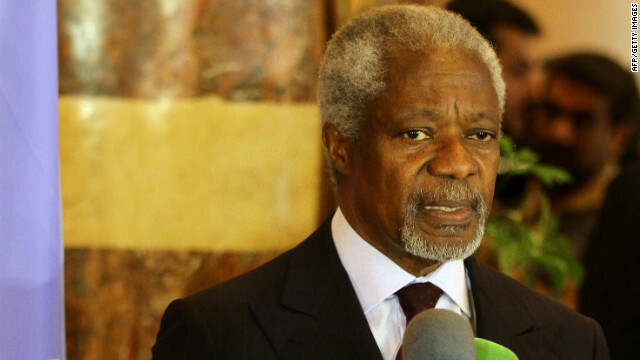 Joint Special Envoy Kofi Annan is in Syria, though rebels say his peace plan is dead. "I have come to Syria at a critical moment in this crisis. And I extend my profound condolences and my heartfelt sympathies to the families of the victims and to the wounded – in Houla and throughout the country. The Security Council has requested the UN to continue to continue to investigate the attacks on Houleh. Those responsible for these brutal crimes must be held accountable. I understand that the Government is also investigating. It is the Syrian people, ordinary citizens of this great country, who are paying the highest price in this conflict. Our goal is to stop this suffering. It must end and it must end now. I urge the Government to take bold steps to signal that it is serious in its intention to resolve this crisis peacefully, and for everyone involved to help create the right context for a credible political process. And this message of peace is not only for the Government, but for everyone with a gun. The six-point plan has to be implemented comprehensively. And this is not happening. I intend to have serious and frank discussions with President Bashar Al-Assad. I also look forward to speaking with a range of other people while I am here.